Looking for a USED BLMH-262? Aerotech manufactures motion control and positioning systems and components. Our product line includes automated nanopositioners; planar air-bearing systems; high-speed gantries; linear and rotary and lift stages; brushless linear and rotary servomotors and drives; stand-alone and software-only motion controllers; goniometers; galvanometers; and optical mounts. Aerotech motion controllers, motors, and drives are utilized in our own positioning systems and by end-users and OEMs worldwide. From our Automation 3200 “Soft” motion controller that can control up to 32 axes, to the Soloist single-axis and Ensemble multi-axis stand-alone motion controllers, Aerotech provides a variety of options to suit your application. Aerotech manufactures a selection of linear brushless motors, brush and brushless rotary motors, and drives. 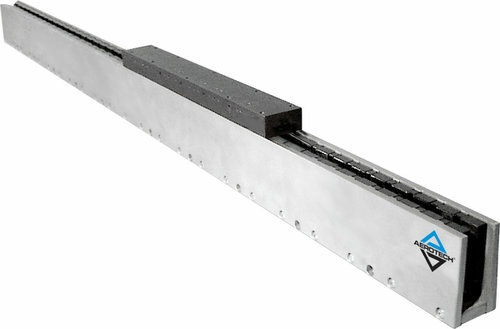 Aerotech’s direct-drive nanopositioning and alignment systems, air-bearing stages, gantries, goniometers, optical mounts, and linear motor or ball-screw-driven stage systems provide the accuracy and velocity control critical to demanding processes. Custom and vacuum-prepped positioning systems and components are also available. 61 ModelsView more about Aerotech, Inc. Looking to Purchase a New AEROTECH BLMH-262?